This is really a no recipe recipe. 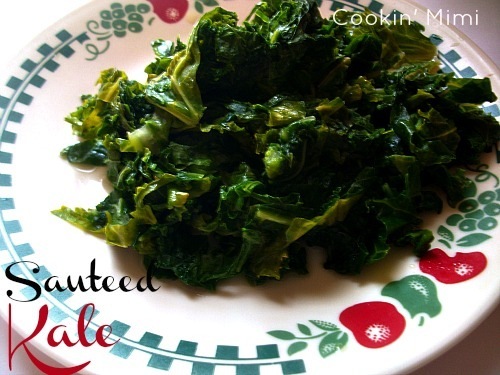 Kale is one of my favorite green vegetables and this is a quick and easy way to prepare it. I have some other recipes coming in the next couple of months that use kale but wanted to share the simplest first. Heat a large skillet with a lid over moderate heat. Add the oil and garlic. Add in the kale and toss to coat with the oil. Pour in the water, cover and cook for five minutes. Remove lid and cook for another five minutes or until liquid has evaporated. Thanks for stopping by. I love to hear from my readers so comments are welcome. I have over 100 more recipes in the index if you want to check them out. Sign up for updates via email or RSS and get the latest from Cookin’ Mimi. It’s free and easy. great recipe. I am going to try it tomorrow.